UIDAI CEO Says Aadhaar Data Is Safe And Well-Protected! The presentation included an explanation on how the biometric details of each individual are processed and are not shared with anyone. With the growing restlessness over the security of Aadhaar data, Unique Identification Authority of India (UIDAI) asserted before the Supreme Court that Aadhaar data is safe, and even made a presentation about how that data is being protected. UIDAI CEO Ajay Bhushan Pandey made a presentation before the court to explain how the data is kept safe while defending the government’s ambitious Aadhaar project. The presentation included an explanation on how the biometric details of each individual are processed and are not shared with anyone. It also stated how strong the encryption protecting the data is. The court also asked several questions regarding the authenticity of biometrics. 2 What Exactly Does Facebook Know About You? 3 How Does My Data Help Facebook? 4 How To Find Out What Facebook Knows About You? 5 Which Data Does Facebook Share With Advertisers? UIDAI assured the court of the invulnerability of all the security measures related to Aadhaar. They also reiterated the fact that Aadhaar will provide a robust, lifetime, reusable, nationally online, verifiable ID card to all the Indian citizens. From July 1 onwards, Aadhaar will now also include face authentication in biometrics, apart from fingerprints and iris data. What Exactly Does Facebook Know About You? After the recent revelations about Cambridge Analytica misusing Facebook data, you might be wondering whether to keep or delete your Facebook account. But before you decide either way, wouldn’t you want to know exactly how much does Facebook know about you? At the very basic level, it works on a very simple algorithm, the more time you spend on Facebook, the more data it collects. Facebook picks up tidbits of information and keeps storing it. Out of this, you have provided some information to Facebook, and the rest it gathers based on your interactions and activity. How Does My Data Help Facebook? With the this harvested data, Facebook brings advertisers to its channelized advertising network, where it connects advertisers with the target customers. Facebook is one of the richest companies in the world, thanks to their masterful advertising policy and the largest online audience on social media. Facebook shares all your interests and other data with the advertisers. Facebook knows more about you than just your birthday, where you live or what you like. So if you want to know exactly what data does Facebook have on you, the social media giant allows you to download all the data it has about you. Click on the ‘Download a copy of your Facebook data’ which you will find at the bottom of the ‘General Account Settings’. Now click on ‘Start My Archive’ button and enter your Facebook password. You will receive an email from Facebook stating that your archive is ready for download. Click on the link and then click the ‘Download’ button on the page that opens. Double click on the index.htm file to gain access to all the information together. There will be multiple sections like Photos, Videos, Friends, Messages, Ads and more. Facebook has almost everything you ever did on Facebook including all the posts you have ever liked and such. Which Data Does Facebook Share With Advertisers? 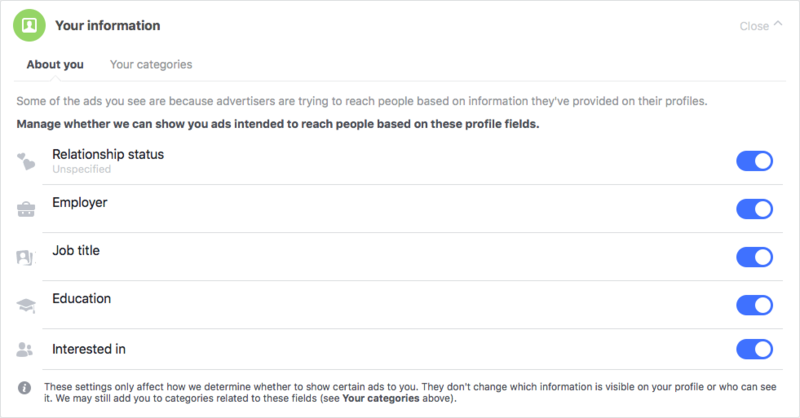 To see which data of yours Facebook shares with advertisers and other agencies, log in, go to Settings and click on Ads (Settings > Ads). Facebook keeps a close track of your interactions, interests and activities on their platform. They share your hobbies and activities, what you follow, the apps you have downloaded and more. You can also see ‘Your information’ where Facebook has a ready profile on you, which it shares with the advertisers and agencies. It has all the data like where and when you last travelled, which device you used to access Facebook, political interests, habits, which ads you clicked, how did you react to a particular post and more. Facebook knows much more about you than even your friends and family. So, now that you know what all information Facebook has on you, at least you can make an informed decision whether you want to stay on or quit Facebook. "UIDAI CEO Says Aadhaar Data Is Safe; What Does Facebook Know About You? ", 5 out of 5 based on 2 ratings.